These include a first draft of Viva Las Vegas (yes, the Elvis movie! 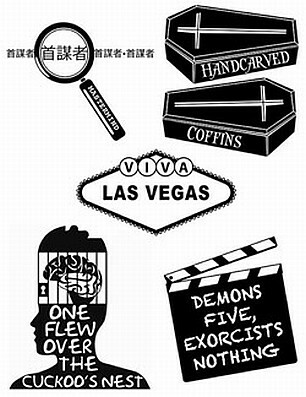 ), a version of One Flew Over the Cuckoo’s Nest meant to star Kirk Douglas, a screenplay based on an unfinished novella by Truman Capote, another constructed around the idea of a “behind the scenes” look at the making of a film very much like The Exorcist, and the story of a Japanese detective set in Tokyo. Each screenplay will be bound as its own collectible Limited Edition volume and those five volumes will then be housed in a hand-made slipcase. Each screenplay is an exact reproduction of the writer’s work, down to any imperfections in the typewriter he was using at the time. You’ll never be closer to these films-that-could-have-been than when you’re reading these screenplays. The versions you will hold in your hands have never been read outside the offices of Hollywood production companies and William Peter Blatty’s personal library, so this is a rare glimpse into an alternate film universe that could have been very different from the one we know. There are no plans for these screenplays to ever be reprinted. To make this project extremely collectible, Lonely Road Books will only be printing enough copies of this beautiful Limited Edition set to fill the orders placed between October 1 and October 25. If 200 copies are sold, that's all that will be printed, so this could become one of the most collectible special editions ever published by Lonely Road Books.